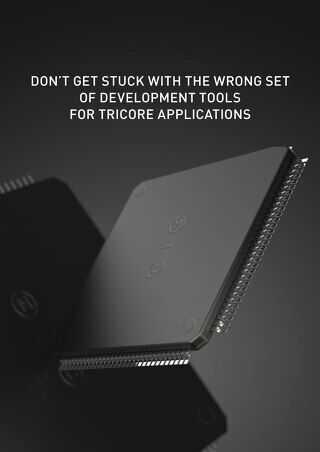 The new TASKING TriCore™ VX-toolset is built specifically to help meet the highest safety standards and increased performance required of today’s multi-core based applications. Its ACT (AURIX™ Configuration Tool) driven technology makes it not just another compiler, but a future-proof developer platform equipped for fast-paced development. Today, Altium announces its new TASKING VX-toolset for TriCore™ v6.1r1, bringing a wealth of improvements and new features to help you get the maximum out of your TriCore™, AURIX™ and latest AURIX™ microcontroller based applications. The TASKING toolset consists of specialized tools for programming and debugging every bit of Infineon’s powerful and diverse microcontroller components. With version v6.1r1, toolset improvements addressing the full range of TriCore-based microcontroller components are delivered. This rich feature set is rounded of by making all tools fully interoperable and easily accessible through the Eclipse Mars IDE, probably the most popular IDE used in automotive. Furthermore, Altium delivers the AURIX Configuration Tools (ACT) as part of the Eclipse IDE, which have been enhanced with iLLD driver updates from Infineon and several iLLD examples by Altium. Using the graphical configuration tools from ACT, configuring your AURIX device is transformed from a cumbersome exercise in manual comprehension into a swift operation that gets your device up and running in minutes. Also the Pin Mapper in ACT has been enhanced with a very helpful Pin Conflicts Solver functionality which will help you to automatically find a pin configuration that matches your requirements. Many users have developed applications built with maybe millions lines of code, using a specific older compiler release and they are reluctant to upgrade to a newer compiler version, which is why we announce “cross-linking”. This cross-linking allows linking of (e.g. validated) object code built with a certain toolset release into a project that is being developed with a newer toolset release. For release v6.1r1, Altium guarantees compatibility of code developed with version v4.2r2 and v5.0r2 of the product, under specific conditions. This will be of special interest to not only users of Infineon’s MCAL libraries that are ported and validated with these older compiler releases, but also to developers that make use of third party components like an RTOS or a communication stack. You can benefit significantly from this cross-linking guarantee, as it saves you from an additional investment in an updated port of such component. In a future blog we will pay special attention to this cross-linking support. TASKING introduced support for the C++11 standard in release v5.0r2 of the VX-toolset early 2015. Release v6.1r1 now brings support for standard templates, STL features and I/O streams in line with the C++11 standard through the inclusion of the LLVM C++11 libraries, in addition to the STLport libraries according to the C++03 standard already present in the toolset. The board support in TASKING’s integrated debugger has been extended for several AURIX based evaluation kits from Infineon, like the TriBoards TC2x9 and TC2x4, and the Application Kits TC2x7 and TC2x5. And more general in the toolset, the AURIX support has been further improved with updated SFRs for Infineon’s TC27x C-step and TC29x B-step series. For more than 25 years Altium’s partnership with Infineon is much intenser and broader than offering just board or SFR support. We have a long tradition of supporting new microcontroller devices or core levels ahead of their availability to the broad market. If you are an early adopter of Infineon’s new or upcoming MCU variants, you can rely on the TASKING tools to provide you with the necessary support to get into position ahead of your competitors. So if you’re looking into new devices or core levels, the TASKING tools are your best partner to start developing! 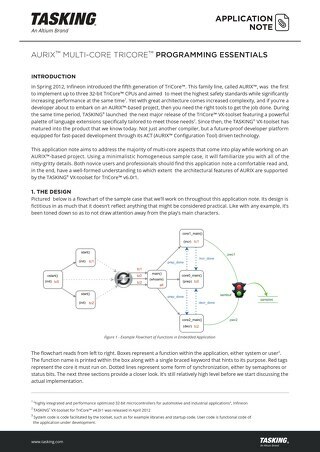 Within the spirit of this close cooperation, Infineon asked Altium for early support of their upcoming EABI v3.0 standard, which brings two new extensions related to alignment attributes. This standard is currently available as draft, but it is firm enough that the implementation of these extensions in the new release v6.1r1 was recommended by Infineon. TASKING’s Safety Checker is a Safety integrity level (SIL) aware static analyzer with the ability to check for interference in the memory space domain and the special function register domain which is helpful to prove "freedom from Interference" as described in the ISO 26262 functional safety standard. Following the introduction of the standalone TASKING Safety Checker, the TriCore toolset’s integrated Safety Checker has been enhanced with further checks and better output control available already rolled out with the standalone version. Many utilities in the toolset also have been improved, such as support for the BOSCH ADX Specification Address List Format for A2L Address Calculation in the High Level Dump utility, and for example ELF symbol and function renaming in the ELF patch utility. The update to v6.1r1 is free if your license is under maintenance. New users or customers without a maintenance contract can contact our sales representatives for an attractive offer for a license purchase or update. Anyone interested in an evaluation copy of the toolset can register through this website and download the v6.1r1 release right away.